Jawaharlal Nehru University, New Delhi, Is Looking For Eligible People To The Post Of 97 Assistant Professors. So Interested People Can Apply For This Job Through Online Mode, Within The Given Time Period. 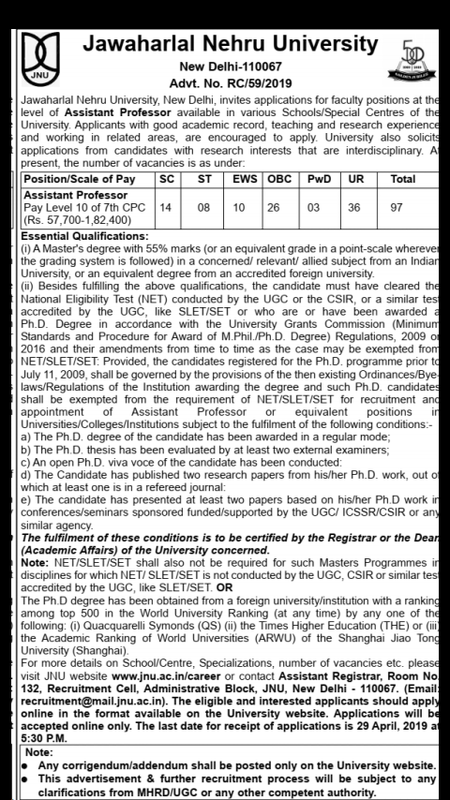 Assistant Professor →97 Vacancies, Kindly Do Check Out The Image Below For Vacancies Distinction And Essential Qualifications. (Credit- The Official Advertisement JNU). B. Eligible Criteria For Assistant Professors Job In JNU Recruitment 2019. Age Limit →JNU Age Rules Applies. Mode Of Examination/Selection Process →Again JNU Selection Process Applies. Online Application/Examination Fee →₹1,000 For Unreserved Candidates And No Fee For Other Reserved Candidate. For More Info →The Official Website JNU. Now Apply For This Job Of Jawaharlal Nehru University Recruitment 2019 For The Post Assistant Professor.